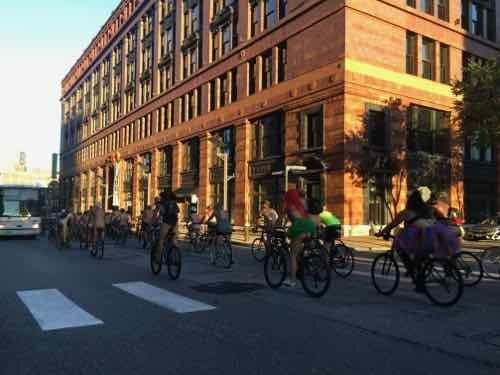 The World Naked Bike Ride in St. Louis is part of an international event to raise awareness of cyclist rights and vulnerability on the road, and promote positive body image and protest oil dependency. I absolutely love this event! Sadly, the first rode here was just months after my stroke — so I”ve only been able to participate as a spectator. AS a spectator even it’s excellent. The hubby and I were sitting at 16th & Washington for about 15-20 minutes before the ride came through. In that time we talked to numerous people — strangers. One couple suspected what we were out: “Ready for the naked bike ride?”. they asked. Others, pedestrians & motorists, asked us what was going on. Unlike many other events, I saw no corporate sponsors, though many local businesses are partners. I saw almost no genitalia — but I wasn’t looking either. I was bust waving, reading signs, enjoying the creative costumes & body paint. Nothing remotely;y indecent. Q: Agree or disagree: The annual World Naked Bike Ride encourages indecent exposure. An important part of the ride is to promote a positive body image, to show the world we’re not all cover models. How we feel about ourselves as people directly impacts what we ultimately see in the mirror. Negative messages from others in our lives and from the media can make this a challenging proposition. Creating a positive body image requires being able to integrate our feelings about ourselves with the messages we are getting from others. Years ago I did some design work at a local facility that treats patients with eating disorders. Seeing young people with visible bones but think they’re fat leaves a lasting impression. My stroke caused me to have a food disorder, gourmand syndrome.Desiring fine food I have to work hard to not get even fatter. Keep it up St. Louis, ignore those who can’t see past exposed skin. The auto industry is quickly moving toward full self0-driving cars. The impact on cities, including St. Louis, could be huge. You might be thinking it is a decade or more away, but earlier this month GM announced a a major accompaniment. General Motors said Tuesday it has finished making 130 self-driving Chevrolet Bolt test vehicles, an achievement that the automaker says will help put it at the forefront of the race to develop and deploy autonomous cars. Honda has been one of the more cautious automakers when it comes to self-driving cars, and a recent study put the company at 15th out of 18 in terms of overall advancement. At a media event this week, however, Honda shared more about its plans and set a target of 2025 for introducing vehicles with Level 4 autonomous driving capability. Level 4? We’re not going to go from fully human-controlled cars to full self-driving overnight. Level 0: This one is pretty basic. The driver (human) controls it all: steering, brakes, throttle, power. It’s what you’ve been doing all along. Level 1: This driver-assistance level means that most functions are still controlled by the driver, but a specific function (like steering or accelerating) can be done automatically by the car. Level 2: In level 2, at least one driver assistance system of “both steering and acceleration/ deceleration using information about the driving environment” is automated, like cruise control and lane-centering. It means that the “driver is disengaged from physically operating the vehicle by having his or her hands off the steering wheel AND foot off pedal at the same time,” according to the SAE. The driver must still always be ready to take control of the vehicle, however. Level 3: Drivers are still necessary in level 3 cars, but are able to completely shift “safety-critical functions” to the vehicle, under certain traffic or environmental conditions. It means that the driver is still present and will intervene if necessary, but is not required to monitor the situation in the same way it does for the previous levels. Jim McBride, autonomous vehicles expert at Ford, said this is “the biggest demarcation is between Levels 3 and 4.” He’s focused on getting Ford straight to Level 4, since Level 3, which involves transferring control from car to human, can often pose difficulties. “We’re not going to ask the driver to instantaneously intervene—that’s not a fair proposition,” McBride said. 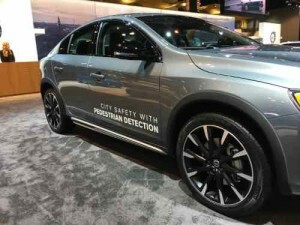 Level 4: This is what is meant by “fully autonomous.” Level 4 vehicles are “designed to perform all safety-critical driving functions and monitor roadway conditions for an entire trip.” However, it’s important to note that this is limited to the “operational design domain (ODD)” of the vehicle—meaning it does not cover every driving scenario. A study released in April says Ford is leading others in the race to produce autonomous vehicles. When will I be able to buy an autonomous car? That’s not an easy question to answer because it’s not yet clear how the technology will come to market. It’s likely that most automakers will be able to build Level 4 autonomous vehicles by 2021 or so, if not before — but the first Level 4 vehicles may be very expensive, and they may be offered only to fleet customers (like Uber or Lyft). 24) Cities will become much more dense as fewer roads and vehicles will be needed and transport will be cheaper and more available. The “walkable city” will continue to be more desirable as walking and biking become easier and more commonplace. 40) Many roads and bridges will be privatized as a small number of companies control most transport and make deals with municipalities. Over time, government may entirely stop funding roads, bridges and tunnels. 41) Innovators will come along with many awesome uses for driveways and garages that no longer contain cars. There will be a new network of clean, safe, pay-to-use restrooms that become part of the value-add of competing service providers. What does all this potentially mean for St. Louis? Fewer privately owned cars means on-street parking and parking garages will have increasing vacancy. Less revenue from meters and parking tickets. Privately-ownewd garages will no longer be profitable — unless leased to a fleet operator. Enterprise already owns the garage attached to Mansion House, Gentry’s Landing, and hotel. Some jobs will see less demand and eventually go away. Parking enforcement, for example. There will be less demand for gasoline but an increased demand to infill more densely. Will the city have the funds to narrow roads, improve infrastructure to work with autonomous cars? Maybe, new residents might add enough to the tax base. Will St. Louis be one of many municipalities in St. Louis County by then or even be a big consolidated government? Car dealerships, new & used, will begin to disappear. New houses, condos, etc won’t have garages as we know them. Existing garages may be converted into additional living space, perhaps a mother-in-law suite. Oil change, tire shops, and auto repair will also see reduced demand until finally disappearing. Yes, autonomous vehicles will need tires but the fleet companies won’t run to the corner tire shop. There are many more positive and negative implications of the transition to autonomous vehicles. The important thing to remember is it won’t happen overnight — but it’ll likely happen faster than many expect. It’s the oldest and most basic form of transportation — walking — and more people are doing more of it to get fit or stay healthy. But there’s new evidence today that even walking across the street is getting more dangerous. A report released today by the Governors Highway Safety Association shows that the number of pedestrians killed in traffic jumped 11 percent last year, to nearly 6,000. That’s the biggest single-year increase in pedestrian fatalities ever, and the highest number in more than two decades. The ability to see the road ahead, along with any pedestrians, bicyclists or obstacles, is an obvious essential for drivers. However, government standards for headlights, based on laboratory tests, allow huge variation in the amount of illumination that headlights provide in actual on-road driving. With about half of traffic deaths occurring either in the dark or in dawn or dusk conditions, improved headlights have the potential to bring about substantial reductions in fatalities. In the initial test only the Toyota Prius V got a good rating — out of 31 vehicles tested. Lighting didn’t improve with the price of the car. Out of 11 pickup trucks (and 23 possible headlight combinations) tested, the Honda Ridgeline was the only one to earn a “Good” rating, the highest mark possible. One truck earned an “Acceptable” rating, a few were deemed “Marginal,” and a majority scored a “Poor” ratings. As previously reported, IIHS headlight testing includes high- and low-beam performance on straight roads and curves. The tests also include glare toward oncoming traffic. Outdated federal rules have blocked automakers from introducing adaptive beam headlamps that automatically adjust to oncoming traffic to reduce glare and help drivers see better, even though the technology is legal and available in Europe and Japan. At the same time, sleek styling and manufacturing mistakes on currently available systems has led to poor performance on the road, including excessive glare and insufficient light on the pavement. Here are some examples of how headlights have changed over the years. 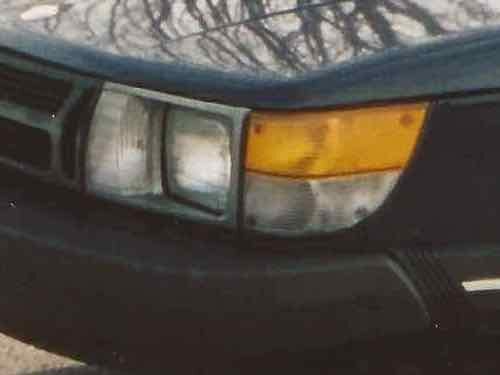 This was my first of two 1986 Saab 900s, the last year US 900s had old fashioned sealed-beam headlights. 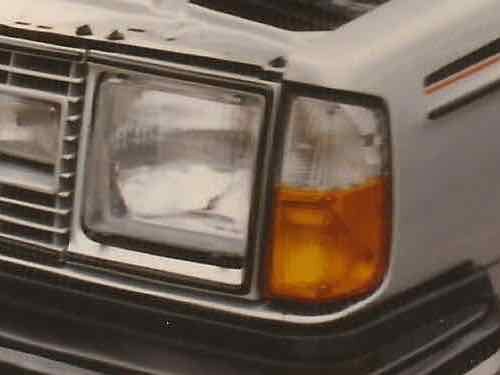 1987 900s got flush headlights — though different than thud on aurorean models. This is a late 70s Volvo 242GT with a round sealed bram headlight. This is the same model with a flush glass headlight. 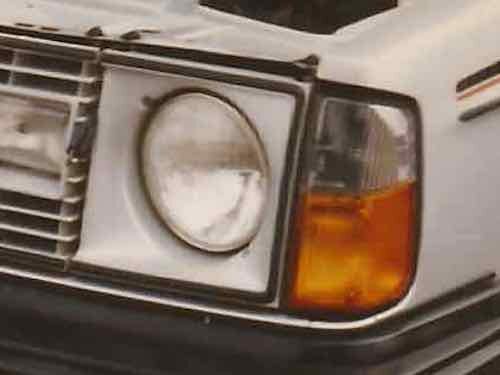 I briefly owned a 1982/83 Right-hand Drive Volvo 240 that had flush glass headlights like these, though without the wipers. 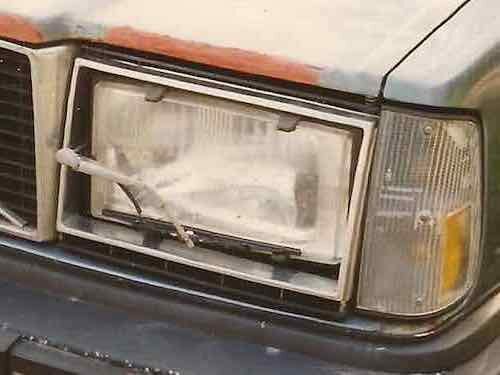 US models had 2 rectangular sealed beam units per side at the same time. The turn signals here are US spec — no more prominent amber color like the prior examples. 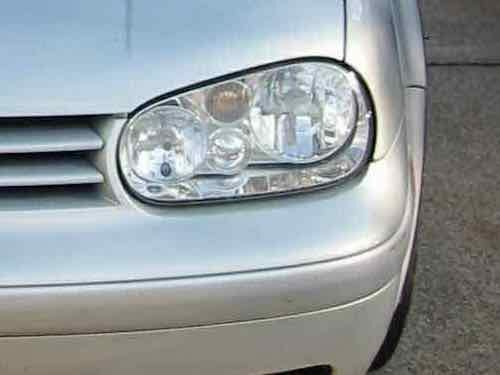 My first daily car with flush headlights was this 2000 VW Golf. Replacing a burn out bulb required a trip to the dealer service dept. Later cars were easier to replace the bulb. Still, US headlights differ from models sold in other countries. They get glass, we get plastics. Most modern headlight lenses are made of clear and nearly unbreakable polycarbonate plastic or a similar material. The lenses are treated at the factory with a special coating that protects them from the ultraviolet (UV) rays in sunlight, vehicle exhaust fumes and other environmental contaminants. In fact, to obtain government approval, plastic headlight assemblies must pass a three-year U.S. Department of Transportation durability test. 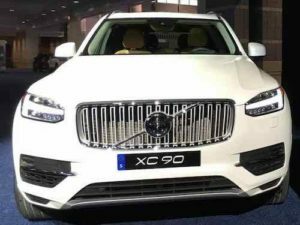 The Insurance Institute for Highway Safety reported Tuesday that only two of the U.S. auto industry’s 37 mid-size sport-utility vehicles offer headlight packages with “good” performance. Safety advocates warn that poor headlight performance, including incorrectly aimed beams and excessive glare, endangers motorists and pedestrians. IIHS, which has been gradually testing the hundreds of models sold in the U.S., concluded that 11 models offer “poor” headlights, 12 fall in the “marginal” category and 12 are “acceptable.” The organization ranked 2017 models based on the best-available headlight package on each vehicle. I’ll save recent headlights, daytime running lights, and front turn signals for a future post. Option: Minority Of Drivers Put Others At Risk By Not Using Headlights When Visibility Is Reduced. June 7, 2017 Featured, Transportation Comments Off on Option: Minority Of Drivers Put Others At Risk By Not Using Headlights When Visibility Is Reduced. The latest Volvo’s have distinctive “Thor’s Hammer” daytime running lights. I got pulled over once for not having my headlights on when I should have. Years ago I bought a used Audi A4 where the dash lights were on if the car was on. Leaving a restaurant on South Grand my first night with the car I could see fine due to all the urban light pollution, but others couldn’t see me. A few cars before the Audi was a used Volvo that allowed me to leave the switch in the on position — the lights went on and off with the car. Anyway, a longtime pet peeve of mine is people who don’t have their lights on when they should. I rarely drive now, just once or twice each weekend. Maybe a weeknight dinner out (will be on South Grand again tomorrow night for our 3rd wedding anniversary). Most drivers are good about using their lights, but 5-10% are not. Q: Agree or disagree: Drivers should turn on their headlights only when they have trouble seeing the road. All but 3 answered correctly. The 3 who agreed with the statement are wrong — they’re likely among those putting at risk by not turning on their lights when they should. Headlights aren’t just for the driver to see the road, they’re for others to see you. I (barely) see untold numbers of headlight-less drivers at dusk, on cloudy days, and in other low light situations and to me, it’s dangerous. I habitually turn my headlights on when I start my car and I wish all cars were made so that they were always on when the engine is running. Seconded! I was just about to comment along these same lines. I’m glad someone else already did! Headlights are extremely important for pedestrians to see cars! The fact that this topic is even up for debate (amongst society, not necessarily this page lol) is infuriating. As long as there are humans walking on this planet motor vehicles should always have to have headlights on at night and daytime running lights on during the day. It’s a safety issue. I wish Missouri police would step up their ticketing of people who aren’t using their lights during the night and when it’s raining (which is actually required by state law and is posted on every roadway upon entering the state). Back around 2002, Regina Walsh came knocking on my door asking for votes to become a Missouri Representative. She also asked if there was anything I’d like to see passed. With a resounding YES, I said a law to turn on all vehicle lights in rain, fog or snow. Imagine a tractor-trailer going down the middle lane of I-270. Now imagine that truck needs to get into the right hand lane for an upcoming exit ramp. Now imagine a GRAY CAR sitting next to that truck’s right side in the rain with NO LIGHTS ON. You want me to send you a private message with the original letter I typed up to be read in front of the Missouri Legislators? I will. I’m the one that started the ball rolling! Wake up people… Inclement weather hinders others vision from SEEING YOU unless you turn on your damn lights. Twenty years I drove without a single wreck or ticket. – end of rant. (9) “When lighted lamps are required” means at any time from a half-hour after sunset to a half-hour before sunrise and at any other time when there is not sufficient light to render clearly discernible persons and vehicles on the highway at a distance of five hundred feet ahead. Lighted lamps shall also be required any time the weather conditions require usage of the motor vehicle’s windshield wipers to operate the vehicle in a careful and prudent manner as defined in section 304.012. The provisions of this section shall be interpreted to require lighted lamps during periods of fog even if usage of the windshield wipers is not necessary to operate the vehicle in a careful and prudent manner. The laws in all 50 states are similar, though they do vary. A total of 20 states, including Missouri, require headlights when wipers are in use. .
DRLs make cars more visible during the daytime when visibility isn’t reduced by clouds, rain, snow, etc. Automatic headlights? The used Corolla I nought in 2008 had them — they’d come on when I pulled into our parking garage or if it was very late out. I had to manually switch then on many times. A lot of cars (like Diane’s new RAV4) that have automatic headlights are not calibrated low enough to activate when there’s rain or overcast conditions during the day. I still find myself having to manually activate the headlights. I suspect many people don’t even know *how* to manually turn theirs on! And DRL’s (and the always-illuminated dash) Are pox on humanity!! I can’t even count the # of people I see driving with lights out at night because of these things! If it were up to me all lights (front, rear, dash) would be on at all times. Short of that it wouldn’t be difficult for new cars to have lights come on when wipers are used. Once we all stop driving and use autonomous vehicles the issue of lighting will become moot. Until that time, it is relevant. Automotive lighting is one of my favorite topics so future posts will address design and regulation. Sunday Poll: When Should Drivers Turn On Their Headlights? June 4, 2017 Featured, Sunday Poll, Transportation Comments Off on Sunday Poll: When Should Drivers Turn On Their Headlights? For more than a dozen years now this blog has been about issues that interest me, the things I experience as an urban dweller. Automotive lighting is one such area of interest — been thinking about future posts on headlight & taillight design. Driving at night without headlights might sound extremely undesirable at the moment, but in the future, it might be the norm. Luc Donckerwolke, head of design for Hyundai luxury offshoot Genesis, believes that headlights will soon be unnecessary. Talking to a group of Australian journalists, Donckerwolke said autonomy might negate the need for headlights in the future, since the cars won’t need to “see” the road ahead. Future autonomous cars might not need headlights, but those driven by humans do. Today’s poll is related. 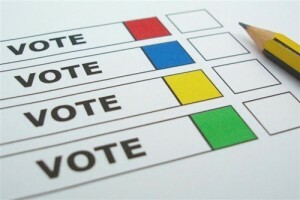 This poll will close at 8pm. On Wednesday I’ll discuss the issues surrounding headlight use and share the results.